Mill Creek Campground was a lovely spot to camp. The campground was a nice size and laid out well. No hookups in any of the sites but water was available in the camp. The bathrooms were nice and fairly new with plenty of hot water and there were trails right off the campground that we enjoyed. My favorite spots were the tent sites. They were all so unique. Some had stairs and hidden spaces stashed away in the trees. They were fairly private and many were set a little ways from the trailer sites. 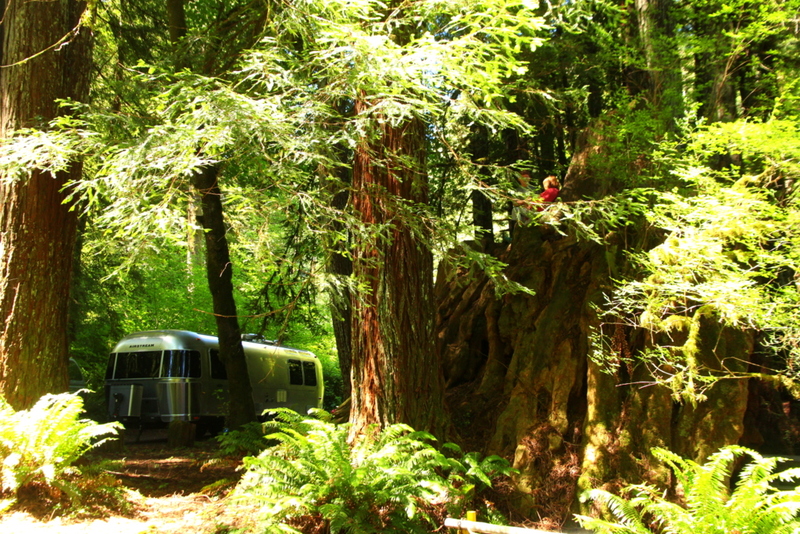 If Del Norte was closer to us, I would love to return for a tent camping trip here. There were less sites for large trailers like ours, but there were still back ins, and pull thrus and plenty of choices. I really loved our spot. Behind our trailer, we had a grassy area in the sun tucked out of view. There were large trees bordering us that the kids loved to climb. 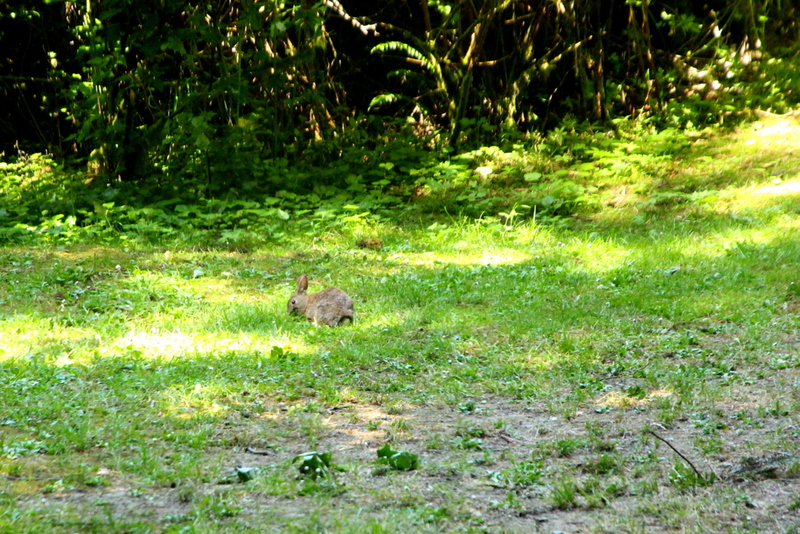 Every day a little bunny would come to visit in the morning and late afternoon. There were also chipmunks, birds and blue butterflies. Don’t forget the bears. Yogi and friends are well in attendance here. Huge fines will result for food or coolers left unattended. My daughter did spot a baby bear, not in the campground but along the road as we left the park one day. Our little friend, the bunny. We stayed inside peering out the window until he was done with his meals. Even Lady was mesmerized by him. There were many stumps to climb near our site. 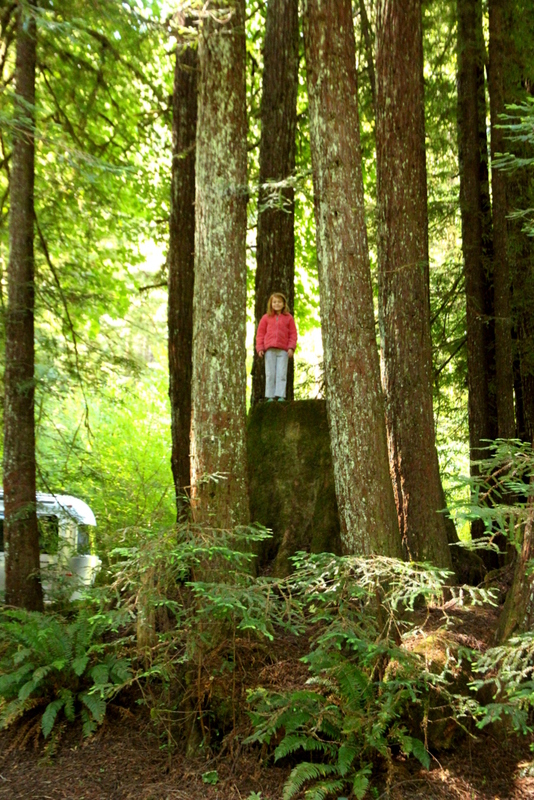 The kids loved to be up on this top stump talking and playing. 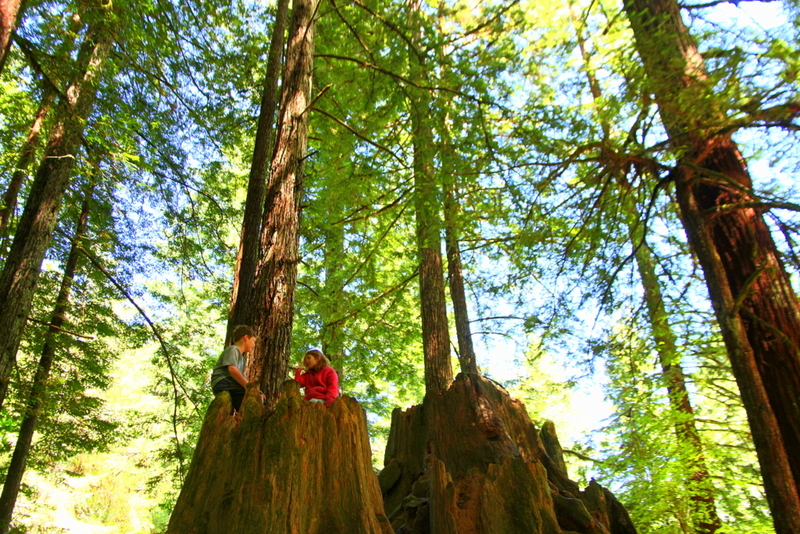 Maybe they were imagining what it was like to be a tall redwood growing in the forest? Sleeping in…This little man must be growing as he slept in the latest every.single.day. Looks like he has a snuggle partner keeping him warm. Of course, there were campfires and marshmallows. 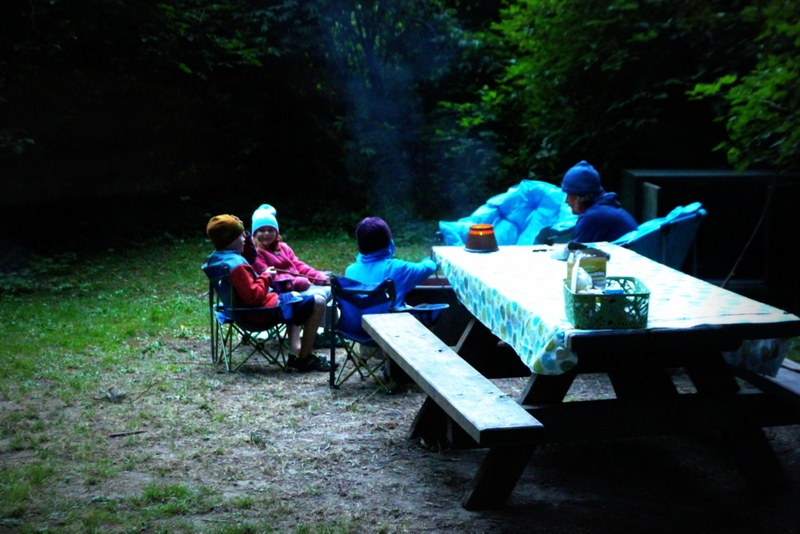 It was the sole request from our kiddos that at least we had one campfire at each camping site. How can you say no to that? This was our first time staying in the woods since our epic fail in Hendy Woods back in February. We were prepared this time. We had updated our batteries; carrying 4 new Lifeline AGM’s. We also changed out all our old lights to LED’s, bought a Honda generator and changed out our shower head to conserve on water usage. We did not have a problem at all. 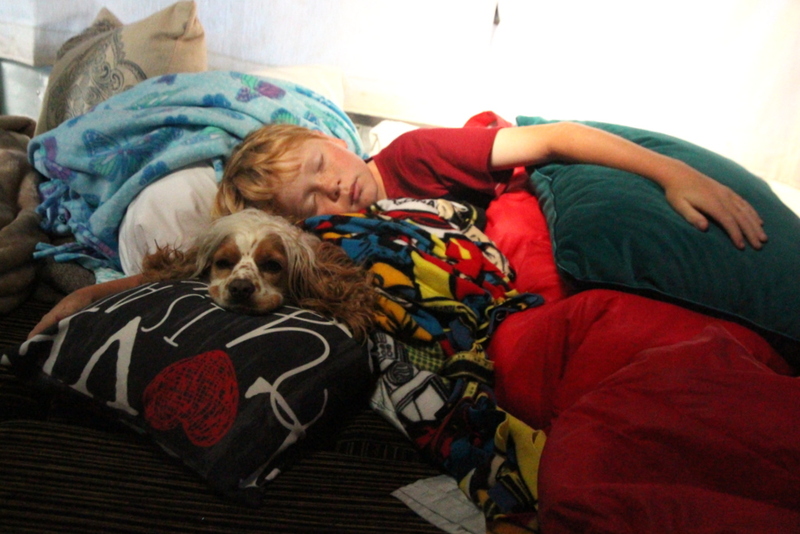 In fact, in the 3 days we stayed at the park we never needed to charge our batteries. We never froze, didn’t lose our refrigerator, propane or power of any kind. A success! Such confidence this gave us to camp in more forests on our trip.